America's largest social selling women's apparel retailer drives leadership amid U.K. expansion. LOS ANGELES, Jan. 30, 2019 /PRNewswire/ -- The largest American direct-sales women's fashion brand, cabi, will sponsor the Destined for Bigger Things women's conference taking place on International Women's Day, 8 March, in Windsor, United Kingdom. As part of their expansion across the U.K., this conference is seen as a perfect collaboration; designed to inspire, ignite, and empower women. Destined for Bigger Things seamlessly aligns with the personal growth ethos of the Los Angeles-based brand. Having recently launched in the U.K., cabi is aligning with businesses that empower women in their careers, which perfectly syncs with their desire to provide women a flexible opportunity to be in control of their financial future through owning and running a fashion business while contributing meaningfully to the lives of women around the world. Deborah Richardson: She gave up a career in design to focus on her family. Yearning to be back in a career with complete flexibility, she joined the direct sales industry and has never looked back. Since cabi launched here in 2016, Deborah has developed a team of 12 cabi Stylists. Donna Taylor: She is a marketing professional with expertise in client engagement management. She has enjoyed exchanging her corporate 50-hour work week for a career with cabi, enabling her to accompany her daughter on the school run and set a great example for her as a business owner. Jo Perry: Originally from South Africa, Jo has lived in the U.K. since 1987. She has an Industrial Psychology & Economics degree and a diploma in Food & Wine. She loves the way cabi allows her to host events, entertain, and empower others. Mandy Noss: With a marketing, promotions, licensing, branding, and design-focused entrepreneurial background, she's always had highly relational roles. She loves being part of the PDT, growing cabi to its fullest potential here in the U.K. Mandy is passionate about family, friends, fashion, conversation, and music—in particular, country music! Helen May: A business graduate with over 13 years of experience in International Media Sales and extensive experience with charitable work in her local community, Helen loves the flexibility of cabi and the opportunity it has given her to empower women around the world. Niki Martin: A creative, spiritual, and adventurous former oncology nurse and qualified counsellor, Niki is one of four girls and a mother of four daughters, making female empowerment high on her agenda. She is inspired to utilise her learned skills while developing new ones through her cabi career. Sharon Sunley: She has more than 20 years of fashion experience and a lifelong interest in entrepreneurship. Sharon brings a wealth of experience with her and loves the flexibility her cabi career gives her to spend time with her family. Sue Gilmour-Jones: She has a degree in Human Biology and a background in Health Promotion. Sue discovered cabi when holidaying with friends in California and was excited to learn that cabi was launching in the U.K. just as she was looking for a new career that would give her the flexibility around family commitments. 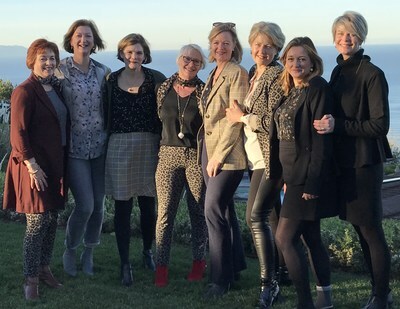 "We are thrilled to have this outstanding group of smart, energetic, and fun women from different backgrounds leading cabi's expansion in the U.K. and identifying like-minded partnership opportunities in the market, like the 'Destined for Bigger Things' conference," said Lynne Coté, CEO of cabi. "Cabi's unique career opportunity, in which a woman is able to define her own success, has appealed to thousands of American women, and we look forward to supporting U.K. women as they develop their own fulfilling and lucrative entrepreneurial careers with cabi." "In this highly challenged retail environment, U.K. cabi Stylists are bringing an unparalleled designer collection to women in a fresh and convenient way, whether it's through personal one-on-one appointments, curated pop-up boutiques in the home, or through cabi Tap, our cutting-edge app," said cabi President, Co-Founder & Chief Culture Officer Kimberly Inskeep. "For almost 20 years, 85 percent of U.S. Stylists return each season to serve their clients through personal styling. This loyalty to the brand goes beyond a Collection that perfectly fits each woman's unique style, it is also in large part due to the collaborative culture and company commitment to affecting lives through enduring relationships." Cabi is meeting the modern women's needs by bringing retail—or what is essentially 2,600 pop-up boutiques—directly to women in their home, which enables them to shop without the frustrations of going into a store. To date, over 1,500 Hostesses help make cabi more accessible by partnering with the cabi Stylists to bring this unique experience to women across the U.K.
U.K. cabi Stylists have funded 80 small business loans to women in developing countries through The Heart of cabi Foundation's innovative lending program, W. E. are cabi, which provides financing and mentorship to empower women to start their own business. These loans made directly to sister entrepreneurs, will ultimately fund five times the amount of loans, which enables hostesses and Stylists to impact women not only in their local communities, but also globally. More and more women around the world crave a personalised experience when finding their own personal style and wardrobe, allowing them to fully embrace the woman they are. Cabi provides women across the U.S., Canada, and U.K. with a styling experience that does just that, by providing an ideal shopping alternative to the retail, online, and subscription experiences, all in the comfort of a home. For more information about cabi, visit www.cabionline.uk. Launched in 2002, cabi provides a designer women's clothing collection and is the nation's largest social selling apparel company. The brand has since become known for its unparalleled quality provided through a unique shopping experience, and network of U.S., Canadian, and U.K. cabi Stylists who form a tight-knit community of collaboration. Cabi's shopping experience is filled with educational and personalised styling ideas and gives Stylists an opportunity to be entrepreneurs in a career that affords a lucrative income, flexible lifestyle, and rich relationships with like-minded women. With a firm foundation of success, cabi is poised to spread their creed "affecting lives through relationship" even further, transforming the lives of women across the globe through their business, and also through their W.E. are cabi Program, which provides small business loans for women in the developing world through Opportunity International.